Ramallah: Head of Water Authority, Eng. Mazen Ghuneim, met in his Office today with the French mission headed by Ms. Catherine Bono, and accompanied by Mr. Quint Palin, the project manager at the French Agency headquarters-Paris, to discuss the work developments in the development projects funded by the French Agency and the future cooperation between the two countries in the water sector. 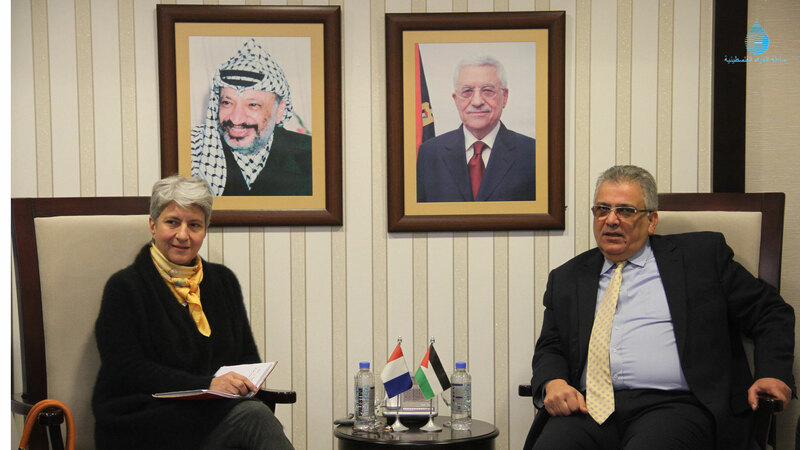 The meeting discussed the steps that are currently working towards signing the agreement for the water harvesting and reuse project in the Gaza Strip funded by the French Government, which aims to reduce depletion of the coastal basin, providing additional water for agriculture, in addition to working on improving capacity Institutional and operational in agricultural water management. Minister Ghuneim added that Water Authority is working on moving forward in accordance with the plans prepared for the implementation of projects and completion of the necessary work stages with regard to water or sanitation projects, in this regard, he appreciated the role of the French Government in supporting the development projects of the Palestinian water sector.